For today's project, I decided to make a shaker card and have Bobo and Pixie peeking out from the sides. All of the images from this release are super cute and you can make them peek out from just about anything. I didn't try making tags, but I know they'd be adorable, too! The additional stamps and dies used for this card are from Papertrey Ink. I'm loving all the great projects that the design team is coming up with and hope you are, too! 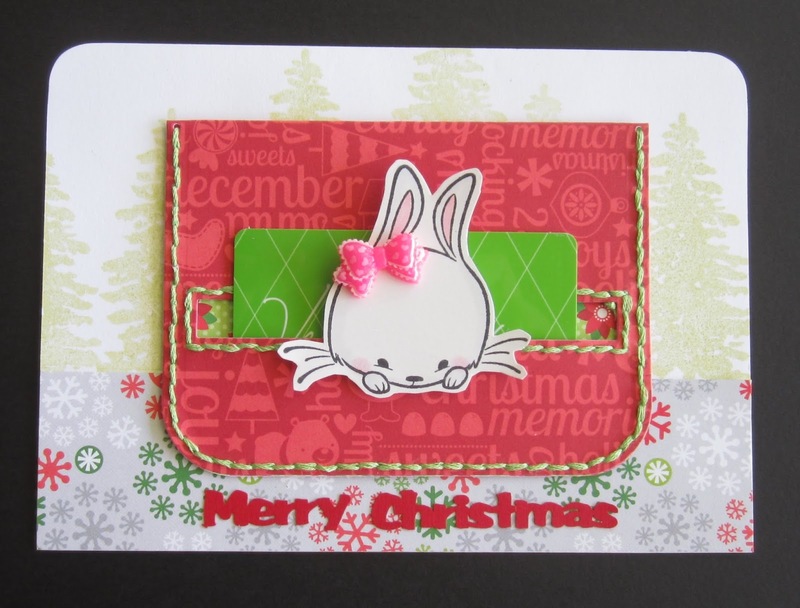 For today's card, I chose to use Dixie and created a gift card holder. It might be a little early for Christmas but I recently took out my stash of holiday papers and couldn't resist! I used a PTI die that's made for stitching coin purses together. I usually make the coin purses out of felt, but tried cutting paper instead and stitched it together with embroidery thread. The opening is normally where I'd insert a zipper, but I used it to create a pocket for the gift card. Evergreen trees are stamped lightly in the background (SU Evergreen) and I used an Island Scrapbooking laser sentiment. My favorite detail is the resin-like bow on Dixie's head! 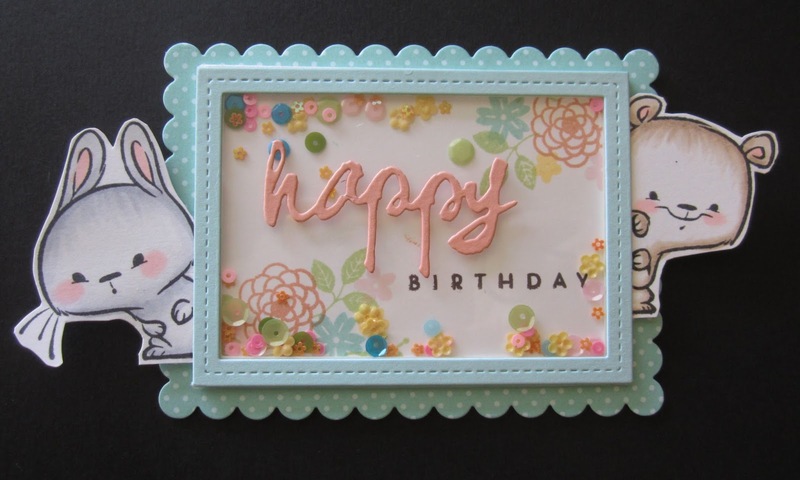 Thanks for stopping by - It's Sister Stamps' 29th release and the cuteness just keeps coming! The "peeking" animals in this release are some of my favorites and they've been so fun to create with! For today's card, I used Buster the dog and I have him peeking over the top of the "sending you" sentiment. The die and matching stamp set are from Papertrey Ink. I'll be back tomorrow with more to share! They're finally available! The fun, super cute summer images from Sister Stamps are available today! 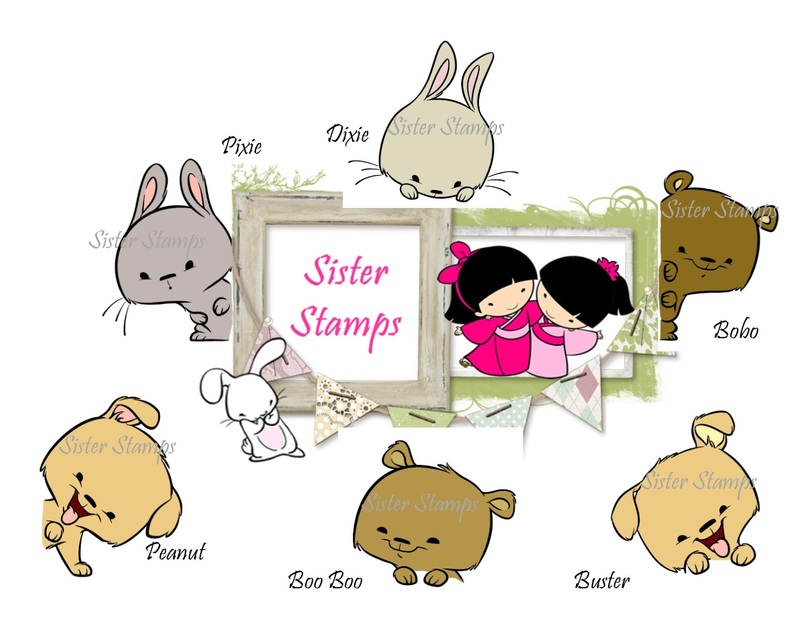 You can check out the Sister Stamps blog for retail locations. Today, my card features Hiilei. I created an underwater scene with some DP I've had in my stash for some time now. I used a Lawn Fawn "Scripty Sayings" sentiment up top and just cut above the outline of the sentiment and layered a striped paper behind it. The sentiment at the bottom is from an old Hero Arts fish set. I used some stickers for the seaweed and bubbles and added the puffer fish and starfish from a previously released Sister Stamps underwater animals set. Hope you've enjoyed this "hot" summer release! Happy 4th birthday to Sister Stamps and thank you to Jenny for inviting me to participate from the beginning! Be sure to check out the other design team members below and have a great 4th of July weekend!! I'm back today featuring Kaumaka who's having fun playing in the sun! The background was created by using a PTI sunrise impression plate on yellow cardstock. Then I cut the sand out using a PTI hills die and the same sand background paper from yesterday's post. 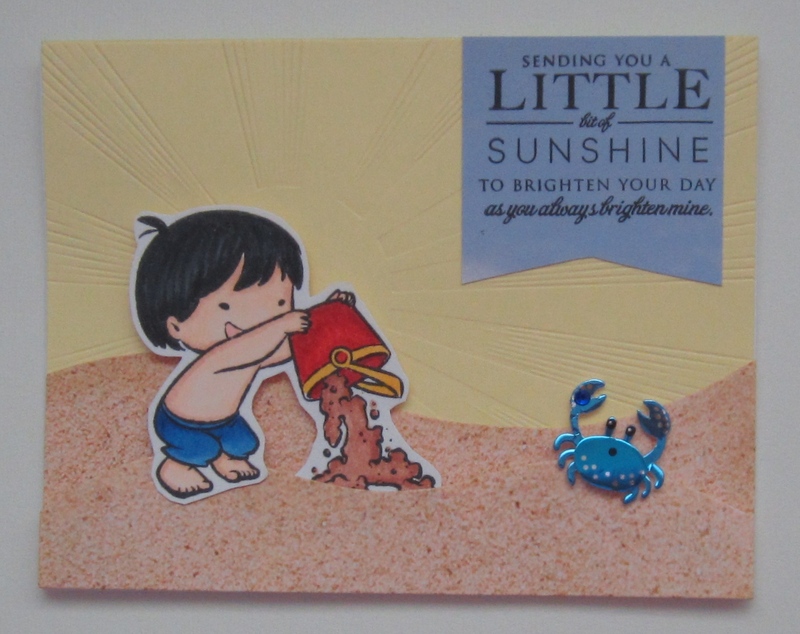 I added a little crab friend using one of Jolee's stickers and the sentiment is from PTI's "Hello Sunshine" stamp set. I somehow always end up creating little scenes for these cute stamps and I hope it's given you some inspiration. Thanks for stopping by and be sure to check out what the other designers have been up to. I'll be back tomorrow with one more post. We're celebrating with seven stamps in this release and they'll be available on July 1. 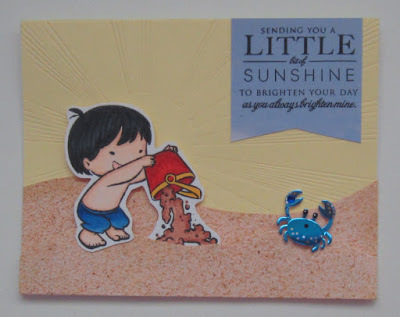 I started out with Aulii and the sandcastle and found the perfect beach scene background paper at Island Scrapbooking. Aulii is so adorable and after coloring her, I decided to give her a little tattoo on her arm inspired by some temporary tattoos I saw on toddlers the other day. I added the smiley starfish from a previous release of sea animals to go with the starfish in Aulii's hand. The sandcastle was stamped on some sand background paper also from Island Scrapbooking and I shaded it a little and colored the flag with Copics. The sentiment is from a PTI stamp set called Flipping Out. Check out other great projects from the rest of the Design Team and I'll be back with more tomorrow. I'm back for day 2 of this fun release and today I'm featuring Pua! My friend who lives in L.A. recently asked me to make her some gift tags so I've been in tag mode. I used a lauhala woven mat paper as the background and paired it with some raffia ribbon. 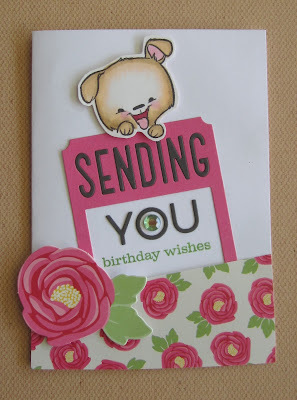 The sentiment stamp from SU is one of my favorites because it's versatile for any occasion. It allows me to make the tags ahead of time and put them on any type of gift. I made the sentiment into a small tag of it's own and hung it like a charm. This gives the tag more dimension and adds a fun element to it, too! Have a great weekend and don't forget to get your new stamps today! I am a SAHM with a toddler son who keeps me busy. But when time allows, I find sanity in crafting and doing anything creative.